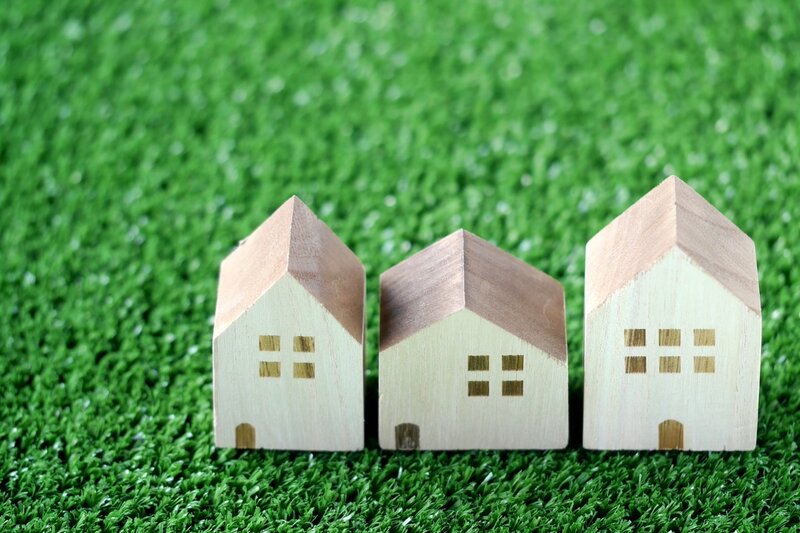 This page provides you tips for finding your ideal property, starting from understanding Japanese real estate practice. Hope this article be helpful for future buyers of Japanese realty. 2. Where is your property? 3. Conclusion: Necessity for your trusted realtor. 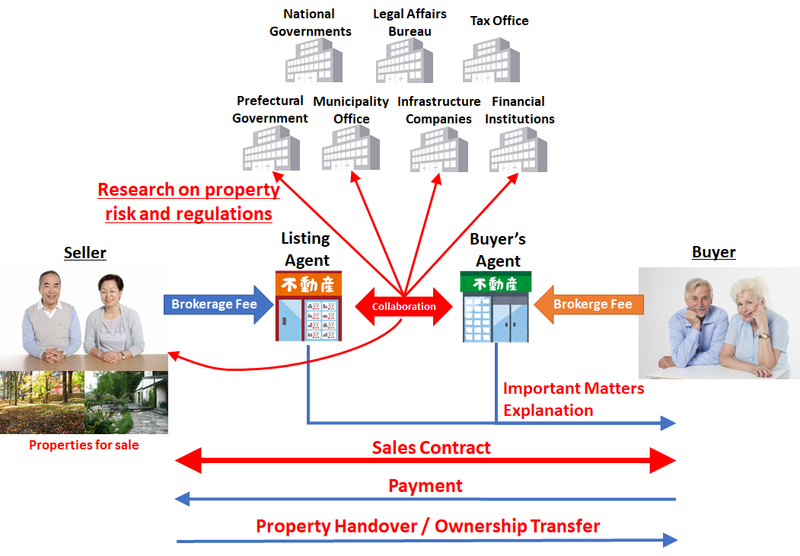 The picture above simply depicts typical real estate transaction ecosystem for Japanese real estate trade. There are some variations in which a seller is real estate developer or house builder company instead of individuals and non-real-estate related corporations for example, or in which a listing agent and buyer's agent are identical company. Some buyers may prefer to buy from the seller directly, since they will think they do not have to pay brokerage fee by taking their roles away from the ecosystem. It is possible (and legal of course), but we do not recommend you to do that, since the seller generally does not know much about risks and regulations for their selling property so much, and it is not obliged by law to disclose and explain such risks and regulations to the buyer. By taking the brokers (listing and buyer's agents) away from a deal, a buyer is exposed to substantial risks after deal is closed and it becomes the owner of property. Realtors', a listing agent's and buyer's agent's, responsibility is significant. Japanese realtor license is issued by prefectural governor (in case the realtor has only its headquarter and branch office in one prefecture) or Minister of Land Infrastructure and Transport (in case the realtor has its offices in multiple prefectures.). Legal responsibility and licensed business scope are the same both for Governor-issued license and Minister-issued license. Resort Innovation is licensed by Nagano Prefecture Governor, but can deal with all the Japanese real estate properties in a same manner as what Minister-issued licensed realtor does. Licensed realtor is responsible for conducting "Important Matters Explanation" to a buyer before contract, and has to explain risks , regulations, known defects, restrictions, and other property specific matters by document and at the same time orally by meeting "face to face" to the buyer (Remote explanation using video-conferencing system will be soon deregulated for leasing contract, but it will take some time until it is deregulated also for "sales" contract as of July, 2017. ). Licensed realtor has to hire "registered real estate notary" at least one among five employees (i.e. at least 20% of company employees has to be registered real estate notary. ), and the company has to have such "registered real notary notary" explain "important matters" in front of the buyer. This is very strict regulation by law. There are generally two kinds of agents in the real estate trade ecosystem, listing agent and buyer's agent. Under Japanese regulation, these two can be an identical company, where such an agent receives brokerage fees from both buyer and seller. It is called "Ryote" (both hands) transaction in industry terms. From buyer's point of view, asking a listing agent to brokerage also buyer side trade may be convenient to know seller's side reason for selling that specific property. On the other hand, such brokerage tend to be disadvantageous for a buyer when the deal goes on to price negotiation stage. Buyer should be careful in selecting your trusted realtor, who can maximize your interests. In this Internet era, it may be relatively easy for you to search your preferred realty by yourself, compared to what we used to do in before-Internet era. If we do not consider a language issue, Japanese real estate property information search system is very sophisticated. 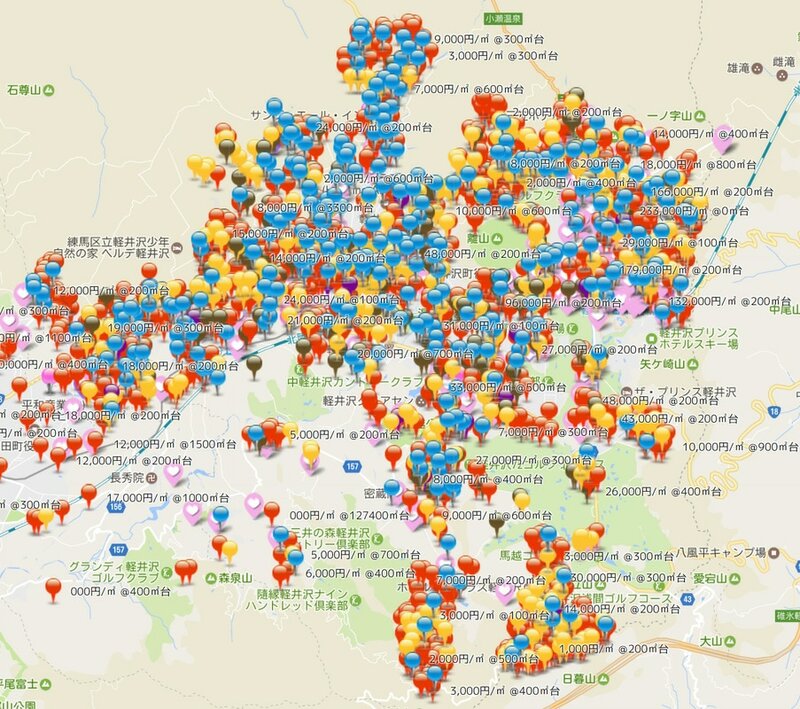 Liful Home's, At Home, and SUUMO are three major platforms to provide such property search service (links jump to their Japanese language site. No English service seems available currently.). Listing agents (and sometimes buyer's agents, too) present their for-sale property ads to those platforms to appeal to buyer's market. In Karuizawa, Nagano, our home ground of business, there are roughly 500 lands, 250 houses , and 50 apartment rooms properties for sale on average throughout the year. Besides these open properties, there are certain market where property information is only exchanged between listing and buyer's agent for several reasons (for example, a seller is reluctant to be disclosed.). The picture above shows screenshot of our Resort Innovation's property information management system for Karuizawa town. We maintain more or less 2000 properties which include both ones currently on sale and ones recently sold out. 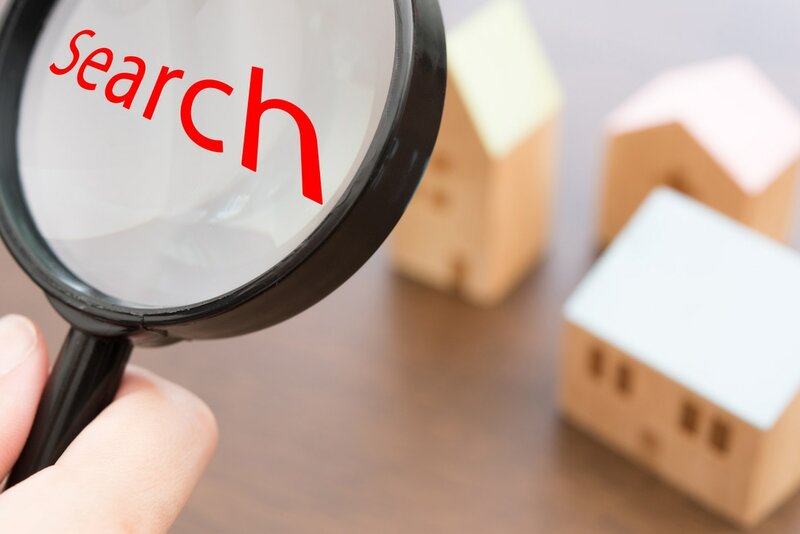 By maintaining those data and associated information, we are ready to provide best possible proposal when we are asked by a buyer for property search. Besides our for-sale listings on our website, we have a plenty of properties to propose. We suppose our competitors do similar. In sum, your ideal property is there not only in ads by listing agents, but also in buyer's agent's database. Buyer's agent can virtually broker any property if the buyer wishes the agent to do so. This should be a good hint for buyers for their successful real estate trade. Each real estate property has its unique characteristics, as everybody knows. No property is the same as others. Finding your best property is not possible by just picking it up by your criteria of budget, location, size, shape, age, etc. Real "realtor" must know property history, construction, neighbors, regulations, life of residents there, and other unfamiliar facts for buyers. Try to find your trusted realtor to find your best, ideal, and precious realty. Resort Innovation is paying every effort to be selected by international clients, by providing end-to-end (start to finish) full English support for whole the real estate dealing process. Feel free to contact us for your Japan real estate inquiries.